Mr. Power, or Dave, as he prefers, had graciously accepted our Rotary Club of Moorpark invitation to speak about how and why he started his company, back in 1968; the principles, and practices he put in place that provided its foundation for success; and the key events marking the rise of the company to its current globally influential stature. He sold his company to McGraw-Hill several years ago, but of course he still maintains great pride in its accomplishments, a heart-felt fondness for its people, and a strong interest in its future. Dave Power, 83 years of age, as of this publication, is a tall, distinguished-looking gentleman, with a clear voice and a quick sense of humor. 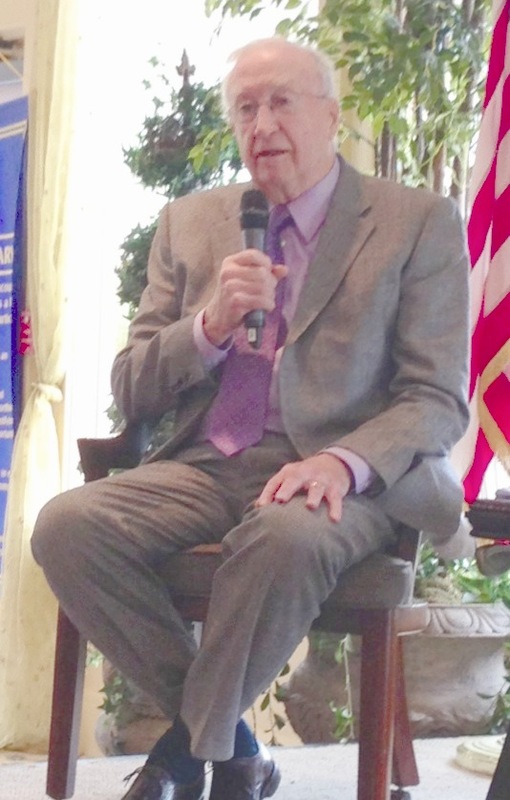 His presentation to our members was arranged as kind of a “coffee table conversation”, moderated by one of our Rotary members, who himself was a retired auto-industry executive. Dave spoke about his upbringing, education, military service, and early business career and how it shaped his character and led him to start his company. J. D. Power & Associates was a family business throughout its history and during the conversation Dave shared vignettes highlighting the sacrifices and contributions of his wife and children to the business. He also shared fascinating stories that marked both the challenges faced and breakthroughs achieved in building the credibility and customer base that the company now enjoys with the auto industry in particular, but in other industries as well. 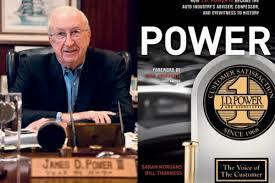 Those stories, and many more, are described in an excellent biography published in 2013, called “POWER – How J. D. Power III Became the Auto Industry’s Adviser, Confessor, and Eyewitness to History, ” written by Sarah Morgans and Bill Thorness (Fenwick Publishing Group Inc., 2013). The business model he used, when he launched J. D. Power & Associates was that they would plan, fund and execute independent customer satisfaction surveys of auto industry products and services. He would analyze the survey response data, identify issues, create reports and then sell those reports to auto manufacturers, so that they could understand their own strengths and weaknesses as well as those of their competitors, and take action. Up to that point, auto manufacturers had been using their own “in-house” marketing organizations to do customer satisfaction research, and Dave was convinced that that process was not providing the unbiased knowledge that was needed. In the early days of the business, J. D. Power & Associates faced a lot of resistance, especially from Detroit automakers. But with good ideas, hard work, persistence and integrity they achieved both the attention and respect of the auto industry, and gave voice to its previously unheard or ignored customers. I doubt whether Dave Power would describe himself as a leader in the pursuit of knowledge and truth, but as I read his biography and did other research in preparing my introductory remarks for his presentation, it occurred to me that he is, in fact, the epitome of a knowledge leader. Each of us, create our own subjective “truths” based on our knowledge, experiences, values, biases, beliefs and hopes. The same is true of our businesses. With these “truths” we build personal and business decision-making models, which we use to interpret what we see and hear and then make decisions on we will respond. The problem is that the “truths” that these models are based on, can be wrong, or at least insufficient. They create blind spots and a set of beliefs, assumptions, and biases disguised as truths that cause poor decisions. Over and over again, those false-truth based decisions have brought business to the brink and sometimes over the brink of disaster. So, although J. D. “Dave” Power III is not a Rotarian, and may not even be aware of the existence of the Four-Way Test, has nevertheless epitomized its principles and objectives throughout his personal and business life. This entry was posted in Better Thinking, J. D. Power, Knowledge Sharing, Leadership, Life, Program & Knowledge Management, Rotary Club. Bookmark the permalink.